FortiOS’s IPS functionality is an industry-proven network security solution that scales up to over 200 Gbps of in-line protection. Powered by purpose-built hardware and FortiASICs, FortiOS is able to achieve attractive TCO while meeting performance requirements. IPS is easy to set up, yet offers feature-rich capabilities, with contextual visibility and coverage. It is kept up-to-date by research teams that work 24 hours a day worldwide, in order to detect and deter the latest known threats as well as zero-day attacks. 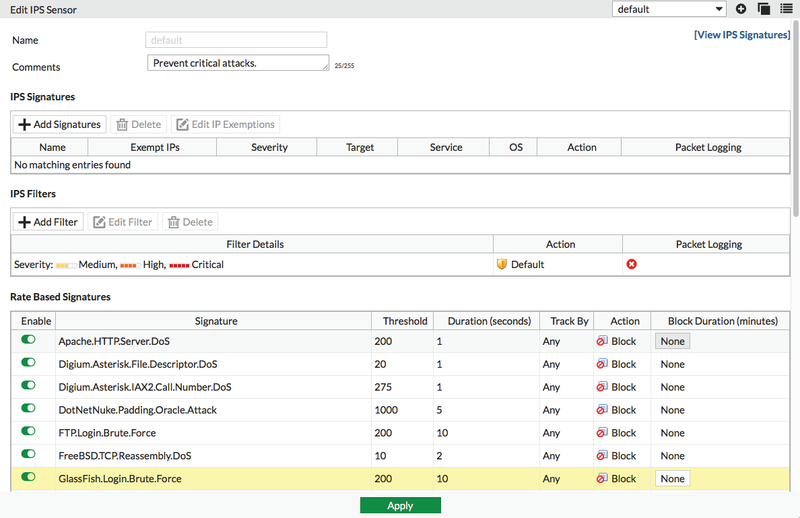 Comprehensive protection provided by a signatures-based IPS engine, protocol anomaly scanning, and DDOS mitigation. Flexible deployment options and actionable implementations for a wide array of network integration and operation requirements. Backed by FortiGuard Labs that deliver real-time protection Maintains up-to-date and proactive protection against latest known threats and newly discovered hacking techniques while allowing time for organizations to patch vulnerable systems. Not only have FortiGates been deployed in some of the largest enterprises in the world since 2002, FortiOS IPS components and FortiGuard IPS signatures are periodically tested and certified by well-known external labs. For example, Fortinet’s FortiGate 3000D earned the highest ratings for Security Effectiveness, blocking 99.9 percent of exploits in the recent NSS Labs DCIPS test. These independent certifications ensure that solutions delivered to customers are of the highest standards in performance, coverage, and accuracy. Rate-based IPS signatures protect networks against application based DoS and brute force attacks. Administrators can configure nearly 30 rate-based IPS signatures and tune them to their needs. Threshold (incidents per minute) and an action to take when the threshold is reached can be assigned to each signature. If the action is set to block, then a timeout period can be set so that the block is removed after a specified duration.